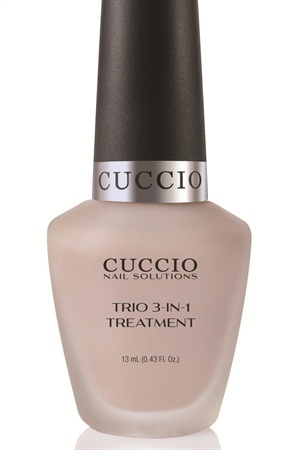 Cuccio has introduced a product to its Nail Solutions line that works to repair the damage inflicted on nails through a variety of factors. Trio 3-in-1 Treatment helps create healthy nails in an instant after application. In addition to strengthening nails, it can be used as a base coat and ridge filler. Used alone, apply Trio 3-in-1 two to three times weekly. When used as a base coat, the formulation sets the perfect foundation under sheer shades to create an opaque, solid application. Wear under white polish for a solid and non-streaky appearance.